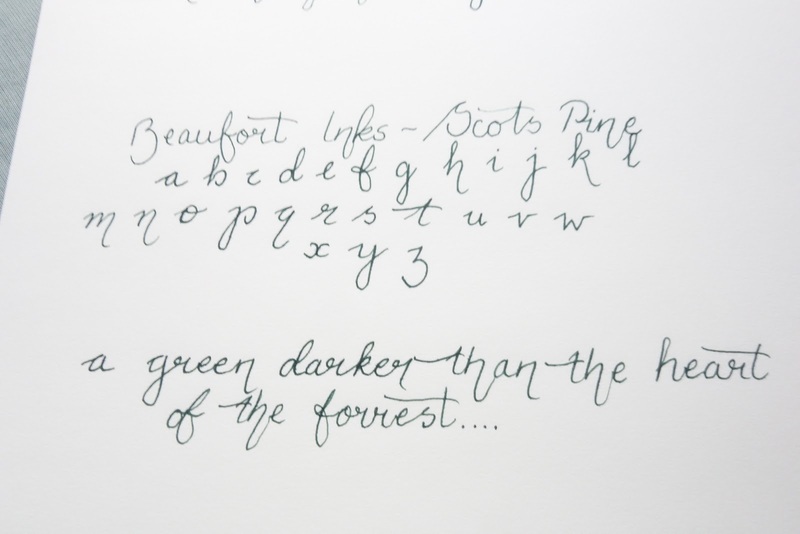 Beaufort Ink are a new name to me, but they are based in Scotland and so they are most definitely worth a punt. Let me tell you a li'l bit about them. They are purveyors of a variety of quality pen paraphernalia - nibs (including a Bock left-handed nib - I needs to get m'self one of THOSE! 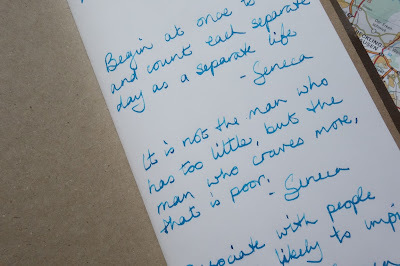 ), all manner of things needed for upgrades and pen-making and now a set of fountain pen inks. And rather delicious they are too. These are available as individual bottles of 45ml for £8.35 or trial packs of 4 x10ml bottles for £8.35. So that's four different inks totalling 40ml for the same price as you could procure on single, full-sized bottle. The trial packs are a great way to find out what you love - and also can be broken up into individual bottles to give as li'l gifties for fountain pen addict friends. Not confident about filling your pen with a syringe and prefer cartridges? No problemo - all he inks are available as cartridges in self-coloured boxes of six for a whisker under £2.00 (standard cartridges). Well, this turned out as far too dark to show off the inks properly and I'll need to nip out and take some more photos. But you can see that the Roasted Red has smoky pimento look to it and it was the first one that my eye was drawn to - well, red, innit? But a USEFUL and classy red. I don't have very many greens, and the Scots Pine looked really smart. But see that Peacock just above it? 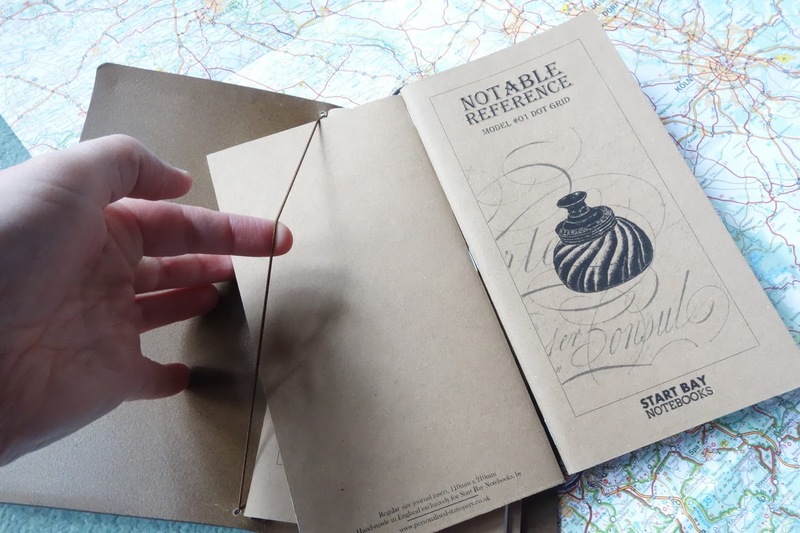 That's a really pretty ink to use and to look at - reminiscent of the Blue Black ... a sort of bluey-green-black and it's definitely in my favourites from the Beaufort range. Scots Pine - definitely a black green, yes? It looks black here, but I promise you, it's GREEN! The Zodiac Blue is a very nice blue. 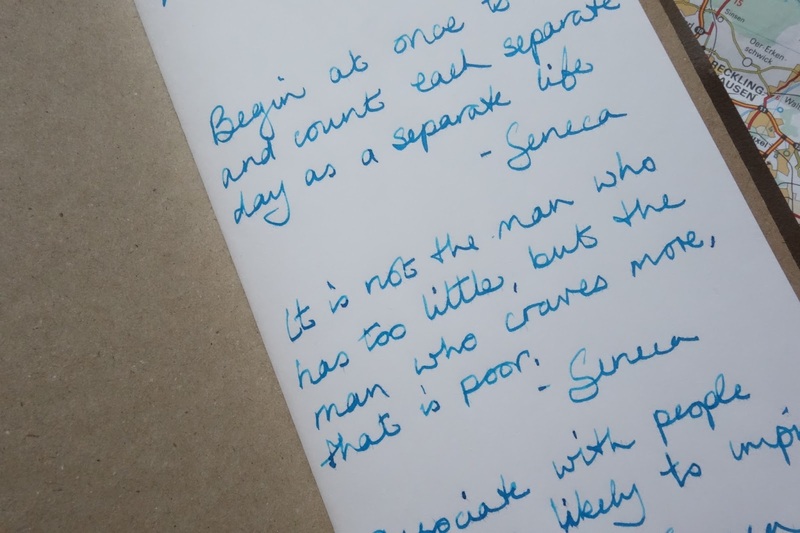 I must be honest and say that I am not hugely excited by black or blue ink because it reminds me of school and I am irresistibly drawn to bright and sparkly coloured inks as surely as I am to Tom Hiddleston. But as you can see here, it's a lovely blue with quite a variety of shading available. Don't worry about the feathering - that's down to my paper and my excruciatingly executed calligraphy. Now THIS is my absolute favourite. The Blue Black is very eye-catching and gives some really nice shading if you have nibs that are thicker than most of mine. This is it in the Namisu Ixion. I know that there isn't much in the way of the Roasted Red here, but I'm writing up a separate review for that next because I'm terribly partial to red ink, it would seem. So let me consider these en famille: All the inks flow really nicely, there is some decent shading and at £8.35 a bottle, I don't think that you can go wrong with any of these. However, I would absolutely recommend getting a taster set so that you can play around with them ... maybe even mix up your very own favourite shade. The taster set of four lots of 10ml actually gives you a good few refills of each colour - you can't lose. And don't forget to check Beaufort out for your pen repair and upgrade requirements. Now, I'm off to buy that Bock left-handed nib! A generous amount of elastic is supplied, look! None of that Midori-single-bit-of-elastic nonsense here. 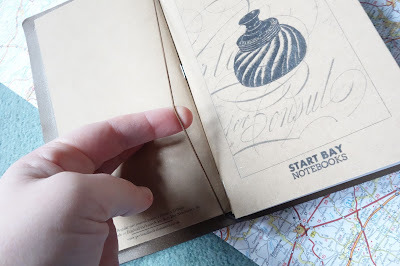 Slide the elastic into the centre pages of two journals to hold them together. 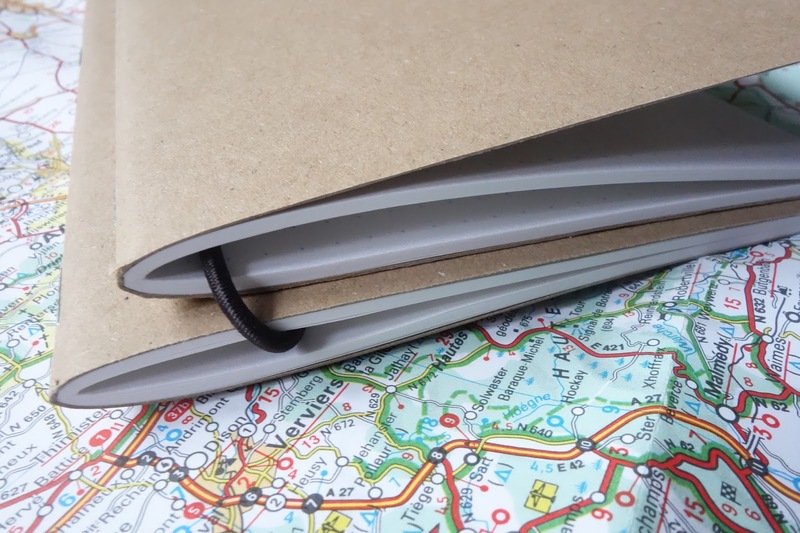 Take your two notebooks that are now looped together and slide beneath one of the elastics that run down the spine of your journal cover. AND there is still space for more to be added! Celebrate with a gin and tonic and book yourself a cheap flight to Italy. Or Birmingham. Wherever! 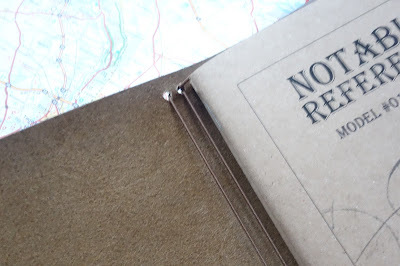 You are now prepared for all travel-writing emergencies! A quick look at the contents of one of the inserts - unlined. 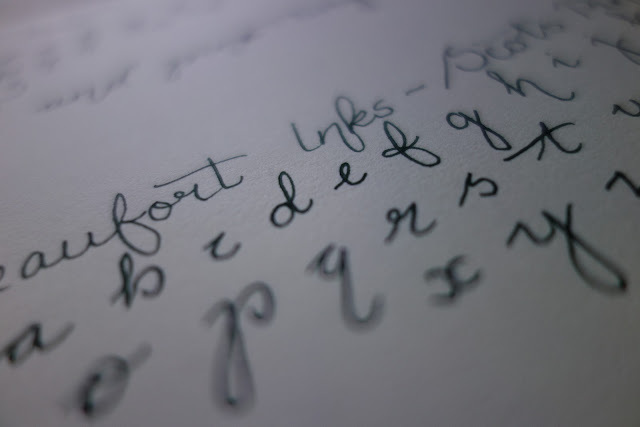 And scribbles by my fountain pen. I can't remember the ink name. But it's purty, ain't it? I must start swatching inks so that I can remember which one is which! Once upon a time, I opted to take part in a Kickstarter campaign to fund a most attractive looking fountain pen that was going to be made here in my home country of Scotland. The company is Namisu and the pen was the Ixion. Fourteen project updates and seven months later, this arrived. Reader, I was super excited! Just peeking out like a new-born baby's head were the tips of the Ixion caps - black with chrome and blue with gold. I squeezed them out of their cozy beds and marvelled at the heavy coolness in my hands. When you've only really worked with Jinhaos and LAMYs, this is a step up. A big step up. An acrophobia-inducing step up. I couldn't wait to fill them. Literally. I dipped them. I dipped the black Ixion in Beaufort's gorgeous 'Blue Black' (getting to be a firm favourite of mine) and dipped the blue one in Beaufort's 'Zodiac Blue'. Lovely line variation, no rail-roading. I am resolved to improve my penwomanship! I can't tell them apart. As you can see by the squeezed in 'extra'. I am a tiny bit in luff, can you tell? magnifying glass is a miracle. It's MANKY. But look at the Bock nibs! Would I take part in another pen kickstarter? I don't know. Probably not. At least this was a company in Scotland. Would I have been so sanguine about my cash and no pen if this was, say, an American company? Nopity-nope. I'm hoping that Namisu have learned a lot from this particular learning curve and that future projects will go more smoothly. Overall effect - I adore them and am madly glad that I have got two!